If you haven’t been able to tell yet, I am a HUGE fan of breakfast. I’ve always loved breakfast food the most, even when I was a picky eater child. I often make breakfast for dinner…my kids have nicknamed it brinner, I’m sure it will catch on soon! 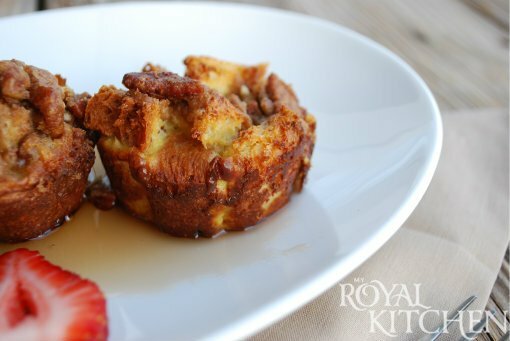 These French Toast Muffins are easy to make and delicious to eat! 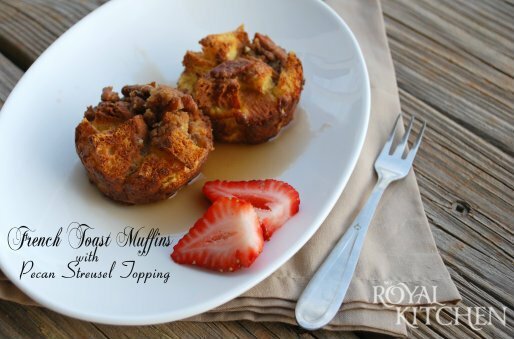 They are perfect for breakfast, brunch or brinner! The real winner here is the Pecan Streusel Topping. In a medium bowl whisk together the eggs, milk, cinnamon, vanilla and sugar. Grease 12 muffin tins and fill them with bread chunks. You may have enough to make more. Start pouring the batter over the bread. You may have to push on the bread to make sure it all gets covered in the egg mixture. Cover and let put in the fridge for at least 2 hours or over night. To make the streusel topping put the butter, sugar, flour and cinnamon in a medium bowl. Using 2 butter knives or a pastry cutter start cutting the butter up and mixing it in with the rest of the ingredients. Mix in the pecans. Sprinkle the streusel over the top of the muffins. Bake at 350 degrees for 25 minutes.